Dental Assistants are used to working with patients who are suffering from poor dental hygiene. Statistics show more than 10.5 million people in the United States are affected by drug and alcohol use. Substance abuse is easily recognizable by Dental Assistants. Many parents are left completely dumbfounded when the Dental Assistant has to inform them that their child appears to have a drug dependency and it is affecting their oral health. Types of drug abuse Dental Assistants encounter include sedatives, barbiturates, and narcotics. The effects of drug use in relation to oral health care include missing dental appointments, fear, anxiety, cravings for sweets, the risk of infection from Hepatitis B and HIV, oral neglect, periodontal disease, gingivitis, and painful gums. It is easy to see from this list how taking drugs can lead to ongoing oral health issues. If the drug use continues tooth lose and inflamed gum areas may increase. Dental Assistants are often consulted when individuals call the dental office or come in complaining of severe tooth pain. This can be a ploy on the patient’s behalf to obtain drugs from the dental facility, either in the office or in the form of a prescription. Dental Assistants need to watch for such scenarios and listen to their gut reaction in such cases. Often, these individuals will come in at closing time, get a prescription and an appointment to return the next morning. They get the prescription filled, but never show up for the appointment. Since drug use is so common, Dental Assistants and other dental staff should be properly trained in the areas of drug use, drug interactions, and promoting drug treatment. If your employer does not offer such training, it is important that you bring it to their attention. In the mean time, it is your responsibility to train yourself by educating yourself in these areas. You can do so with textbooks or online materials. Dental Assistants can provide patients with education, early intervention, and motivation to seek treatment for drug use. 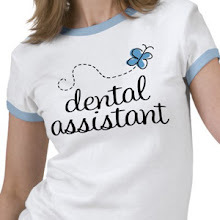 Often Dental Assistants can help the patient find a treatment program to look into. It is important for the Dental Assistant to treat the patient with respect, but fully disclose the risks involved in continued drug use as well as they affects to their dental health. This is where those valuable communication skills come in to play. Dental Assistants need to be very careful when providing dental care to drug users. Since the types of drugs they use generally aren’t disclosed, it is unknown what types of behaviors they will display. They may become violent or experience a chemical reaction when treated with a local anesthetic. Treating patients who use drugs also raises the risk of being exposed to communicable diseases. All precautions need to be taken to protect yourself. Most dental facilities have policies and procedures in place for dealing with individuals who come in for appointments under the influence of drugs and other substances. However, for ongoing drug users, you might not even know they have been using anything prior to treating them. As a Dental Assistant, if you suspect a patient has been using drugs, approach the situation confidentially and carefully. Your main goal is to make sure other patients and staff members are not at risk of being harmed. You have the right as a Dental Assistant to refuse treatment to anyone for any reason. While most Dental Assistants don’t exercise this right often, there is not reason to put yourself or others at risk. Drug use can adversely affect an individual’s oral health. Dental Assistants can offer then assistance with getting treatment for drug use. They can also educate the patient on the effects of drug use. However, this is a gray area where Dental Assistants need to procedure based on the observations of the patient and the policies and procedures in place for the dental facility they work for.